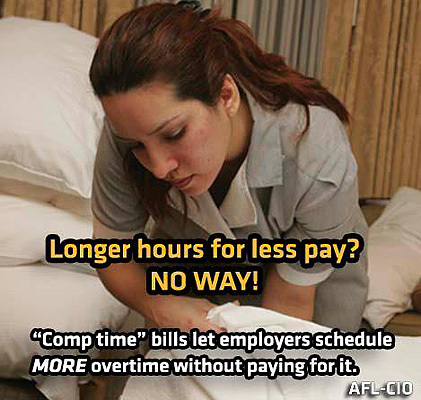 Reposted from the AFL-CIO NOW blog. What would that mean for most workers? 1. 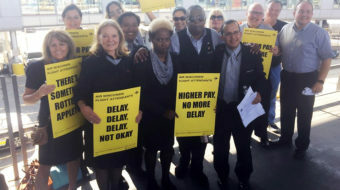 “Comp Time” means a pay cut-Workers compensated with time off rather than cash would see a reduction in their take-home pay. 2. “Comp Time” means mandatory overtime-“Comp time” legislation would make mandatory overtime less expensive for employers. Under “comp time” legislation, employers may be able to receive the benefits of overtime work at no additional cost to themselves. 3. “Comp Time” means more unpredictable work schedules for employees-Making mandatory overtime cheaper for employers would keep workers on the job longer and result in more unpredictable worker schedules and, for workers with children, higher day care costs. 4. “Comp Time” undermines the 40-hour workweek-The only incentive for employers to maintain a 40-hour workweek is the requirement under the Fair Labor Standards Act that they pay a time-and-a-half cash premium for overtime. “Comp time” legislation, by contrast, would encourage employers to demand longer hours by making overtime less expensive. Call Congress today and tell your representative to oppose H.R. 1406: 1-888-866-2561. Also see Mark Gruenberg’s article in the People’s World April 19: GOP pushes to replace overtime with comp time.